The best joystick ever (at least if you're a slightly ageing member of the TechRadar team) is making a comeback – with the Competition Pro that won the hearts of a million gamers for being virtually indestructible in those all night Kick Off 2 bouts shipping for the PC with a collection of C64 classics. Although we are slightly disgusted by the choice of games package (Amiga FTW! 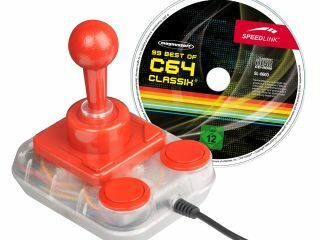 ), this Speedlink version of the joystick is the transparent plastic version rather than the more common black version and the games include classics like Paperboy, Defender of the Crown and Turrican. "Already famous for its black-red design, this year SPEEDLINK is presenting the legendary stick in this great colour-combo: a transparent casing with red controls," says Speedlink's release. "At the time of the C64 and Amiga a rarity this version was special already in those days [sic]. Its extreme durability and the characteristic clicks of the micro switches were its trademarks back in the day," it goes on, slightly confusingly. "The current version comes with an extremely robust, sprung metal stick as well as micro switches. Just like its predecessor, the Competition Pro USB only offers eight directions, and a fire button as an input command. "Despite that, it comes with two large buttons and two additional smaller switches making it suitable for left and right handers. Autofire can be activated by the press of a button – a must for many Amiga games. What's more, you don't need to install a driver." The joystick is priced at €17.99 (c£15.99) and is available now. The only bad news is that it won't work with your Xbox Live Arcade version of Sensible World of Soccer.